What better way to celebrate SummerBlast in Grapevine than with fireworks EVERY Friday night! From Memorial Day to Labor Day, enjoy a free show over Lake Grapevine complete with choreographed music! Scroll down to see more information about the summer fireworks including links to play the matching music. ---> Want to jump to the music for the show? Click here! Have more questions, such as boat ramp access or rain info? Click here to see our FAQs. We&apos;ve got music to match the show! There are two music shows that alternate by weekends. We have made it easy by giving you the option to stream the show here from the page! OPTION 1: If you don&apos;t have the Soundcloud app installed, click on the black "Listen In Browser" button. Please allow up to 15 seconds for the song to buffer. OPTION 2: If you have the Soundcloud app, click on the orange "Play on Soundcloud" button. The app should automatically open. Please allow up to 15 seconds for the song to buffer. The Soundcloud app is free to download for in the Apple and Android stores. It is free to register for an account but is not required to activate the app. If you have the app but have not registered an account, the song should still play. You may see a screen that says "create an account" while the song is playing. Click on the button, and then on the next screen click on "cancel" in the corner. This should display the standard playback controls. Please note that some viewing areas have less cell phone signal than others. It is suggested you check how many bars of service you have and even practice starting the music to see how long it takes to begin playing in the case that buffer times are 30 seconds or longer due to lower cell service signal. We suggest hitting "play" at 9:29 p.m. and then pausing the track to be prepared to hit play once the first shell goes into the air so that the song has appropriate time to buffer. Oak Grove Park provides the most ample parking and the most places to find your perfect viewing spot! 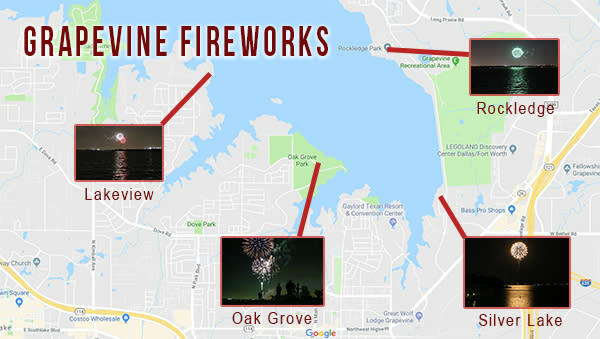 From the baseball fields, to the soccer fields and even the softball fields, you can see the fireworks from almost any spot in Oak Grove. Of course, the closer to the water you can get the easier view you will have as there are many trees in Oak Grove Park. 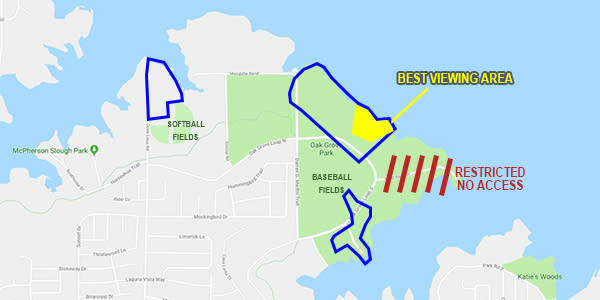 One of the best viewing spots is just off of Oak Grove Loop North, just beyond the fence of the baseball fields. There are small covered benches as well as ample shoreline where you can set up your chairs. 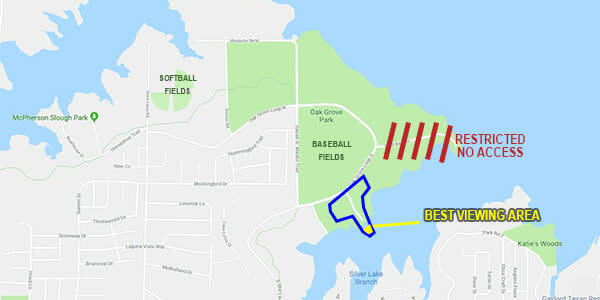 INSIDER TIP: If you&apos;re at the Oak Grove softball fields, walk further down Dove Loop Road to the boat ramp, where you&apos;ll find a small dock and some great water side views. *Areas subject to be closed without notice due to safety reasons including possible flooding. Please pay attention to all barricades, signage, and law enforcement officials. Located just around the corner from the Gaylord Texan Resort, Katie&apos;s Woods Park is one of those hidden "local favorite" spots! Parking is limited in Katie&apos;s Woods, so you&apos;ll want to arrive at least 15 minutes early to ensure you get a parking spot. Some parts of Katie&apos;s Woods have lots of trees, so a walk closer to the water may produce better views. INSIDER TIP: There is a boat ramp and parking lot at the end of Katie Drive. If you arrive early enough, you can park your car directly next to the water and enjoy the fireworks from the comfort of your car! 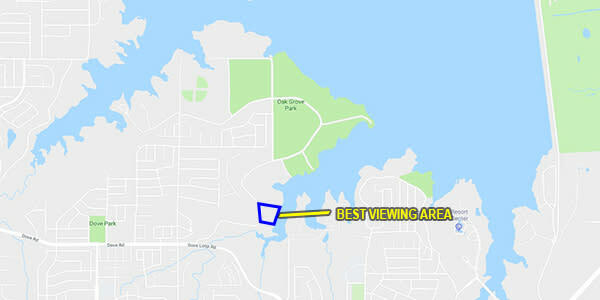 Technically Scott&apos;s Landing Marina is located in Oak Grove Park, but the location is good enough that it warrants getting its own recognition! Located just off of Oak Grove Loop South, there is a small concrete parking lot and a larger dirt parking lot near the marina and dock. It provides fantastic views from which you can watch in the comfort of your own car! 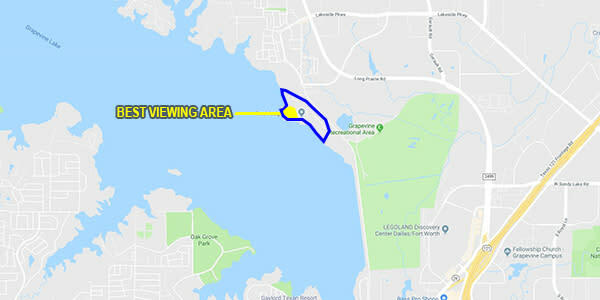 Lakeview Park may be the furthest drive away from Main Street or many of Grapevine&apos;s attractions, but it might also provide some of the best views. 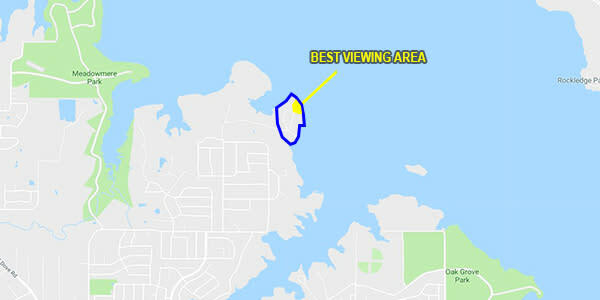 Pretty much all between you and the fireworks are the waters of Lake Grapevine! INSIDER TIP: Go towards the north side of the park to get the best and most unobstructed view of the fireworks. While this is one of the few places that charges an entry fee, Rockledge Park is worth every penny. You get stunning views across the water at Grapevine, the Gaylord Texan Resort as well as all the boats on the water. This park also has the least obstructed views as far as trees are concerned. Parking is limited however, and there are a few pavilions that are available on a first-come first-served basis -- so come early! INSIDER TIP: Come before sunset to get a "pre-show" and stunning view of the sun setting across the water. Also, go to the west end of the park for some mini-"cliffs" for extra added beauty effect. Enjoy your fireworks with a delicious cheeseburger at Big Daddy&apos;s Ship Store located at Scott&apos;s Landing Marina in Oak Grove Park. This small lakeside grill has been a favorite of locals for years, serving up burgers, fried fish and more. The patio is reserved for customers, so be sure to come hungry! INSIDER TIP: The patio is a popular place in the summer, even when fireworks aren&apos;t going as there is often live music, crawfish boils, and other fun events happening. To secure your spot, it&apos;s suggested to arrive as early as 8 p.m. Try to get a table as far away from the building as possible so as to not have an obstructed view. This is another one of those local favorite hidden gems! In the small field and boat ramp near Silver Lake Marina, you can get clear views across the lake at the fireworks! Please note the actual marina docks are for private customers only -- there is no public viewing from the docks. When you turn on to Marina Drive, stay to the right to find the dirt parking lot and boat ramp accessible to the public. (The parking lot to the left is reserved for customers). Please also note that Silver Lake Marina reserves the right to charge for parking (typically there is an entry fee for July 4). Because there is no public viewing from the private docks, please do not contact Silver Lake Marina with questions regarding the fireworks. INSIDER TIP: the parking lot and viewing area are not lit with street lights - it is suggested to bring a flashlight and potentially closed toe shoes or tennis shoes as you may have to walk through some tall grass to get to the viewing areas. 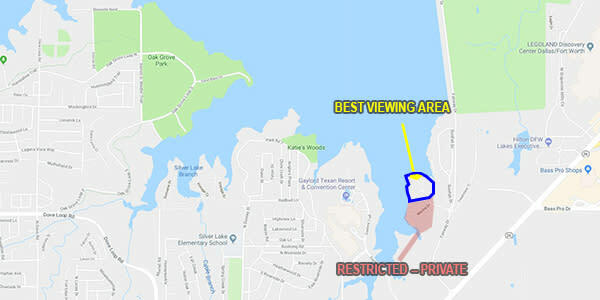 *Red area indicates private area reserved for marina customers only, including parking. Please park in dirt field to the right of Marina Drive. **Areas subject to be closed without notice due to safety reasons including possible flooding. Please pay attention to all barricades, signage, and law enforcement officials. This is a true hidden spot! Located in Oak Grove Park, Acorn Woods has very limited parking and only a couple of pavilions. However if you get there early enough to get one of the coveted spots, you usually encounter the least amount of traffic when the show is over. 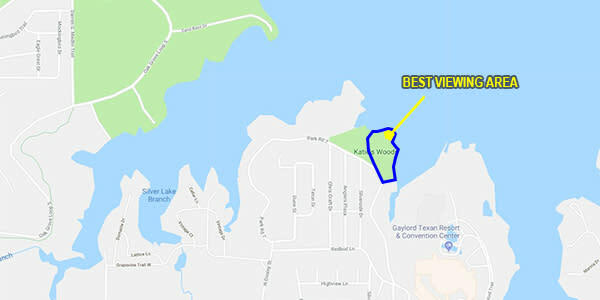 But don&apos;t just hang at the pavilions or in the parking lot (you&apos;ll have to watch the fireworks over the trees if you do) -- follow a small dirt trail about 100 yards down to the water where you&apos;ll get a spectacular unobstructed view of the fireworks. ARE THE FIREWORKS SHOT IN THE RAIN? A: The fireworks can be shot in a very light drizzle. However in moderate or heavy rain, the fireworks show will be delayed as late as midnight or even later in some cases. Please refer to the Visit Grapevine Facebook page for any possible weather updates and timings for the show. Because of how the shells are loaded and charged, it is unsafe for the show operator to disassemble the fireworks. For that reason, the fireworks will always be shot once the rain clears. CAN I VIEW FROM WHERE THE FIREWORKS ARE SHOT? A: For safety reasons, the public is not allowed within minimum 200 yards of the fireworks launch area. WHY ARE THE FIREWORKS NOT VISIBLE IN THE WHOLE CITY? A: Due to the proximity to the D/FW International Airport and arriving or departing planes, the fireworks can not be shot over a certain height for the safety of air-traffic. ARE THERE BOAT RESTRICTIONS FOR VIEWING THE FIREWORKS? A: Viewing fireworks from a boat on Lake Grapevine is one of the best ways to see the show! In fact, you&apos;ll see more than 50 boats on the water on any given Friday night. However, the U.S. Coast Guard will keep boats back a certain distance from the fireworks trailer for safety reasons. Please follow all boating laws and observe any instructions from the U.S. Coast Guard. A: Typically, you can just watch the fireworks from your car or standing by the water without need for any other items. However, we do recommend to bring bug spray with DEET to repel mosquitos, camping chairs, a flashlight, a snack, beverages, and a bluetooth speaker to stream the show music.